Santa Fe’s only free standing cheese shop. 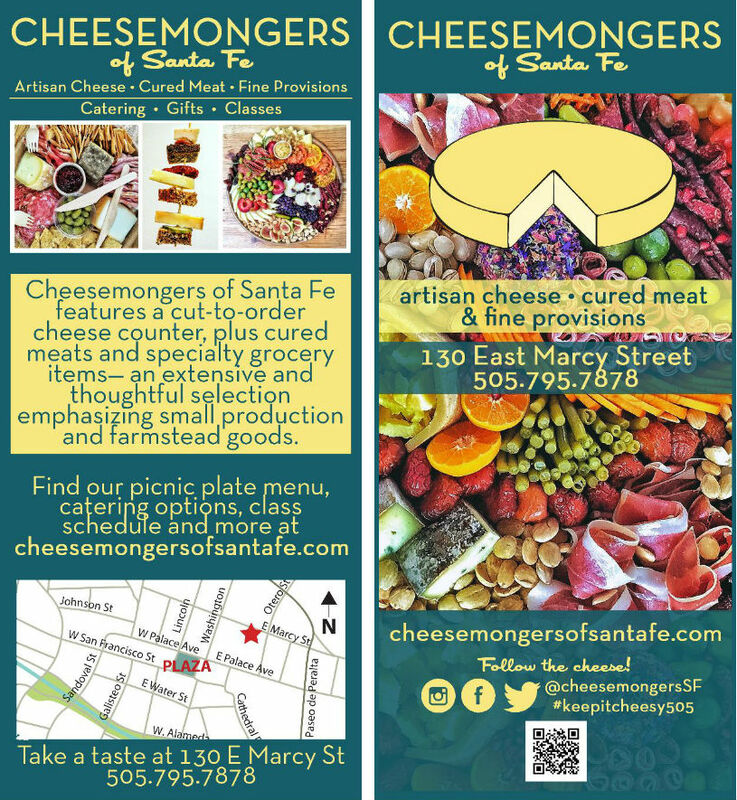 Cheesemongers of Santa Fe features a cut-to-order service counter with a thoughtfully-curated selection of over 100 domestic and international cheeses, as well as cut-to-order cured meats, antipasti, and a tailored selection of accompanying grocery products. We specialize in smaller-scale and farmstead produced goods, and work closely with our many local and regional producers, from cheesemakers and bakers, to the producers of delicious mustards, chutney, honey and pickles. The most significant aspect of our work as cheesemongers is to connect our consumers on a daily basis with the producers of authentic, wholesome, and flavorful foods – foods skillfully crafted with the utmost regard for the preservation of thousands of years of traditional practices, together with the welfare of the land and animals on which all our communities depend. During lunchtime hours, we serve numerous, seasonal cheese-plate selections and a daily grilled cheese. Additionally, we host a series of regular cheese classes, tastings, and culinary demonstrations – working with la Casa Sena Wine Shop as well as local breweries, wineries, distilleries and chefs.